I picked up a beautiful block of haloumi cheese while I was out at Poachers Pantry in Hall. I’ve sliced some and fried it merely for my own pleasure, but had been toying with doing something more with it. On Saturday at the Capital Region Farmers Market, there was a truly sensational crate of Roma tomatoes on their vines. The smell was heady, and they were so fresh, some of them still had bird poo. I was sold. I picked a few vines with small tomatoes on them to roast and serve with the fried haloumi, some zucchini and lamb. Preheat the oven to 220oC. Rub the tomatoes with oil, place on a tray and bake till the skins have burst and the stalks are dark. Finely chop the olives. Add the parsley and chop to combine. Coat the lamb fillets with corn flour and shake off any excess. Roll the floured fillets in the olive mixture and set aside. Slice the haloumi into pieces about 3 millimetres thick. Cut the zucchini in half lengthways, then slice each half at an angle so they are approximately the same size as the cheese slices. Heat a little oil in a non-stick frying on a medium heat. Fry the lamb on all sides, till the outside is golden and the lamb is cooked through to your liking. Remove from the pan, cover with foil and set aside in a warm place. Wipe out the frying pan and heat more oil in it. When the pan is hot, add the sliced zucchini and cook till golden on both sides. Remove from the pan and set aside in a warm place. Fry the haloumi slices till golden on both sides. Drizzle over a squeeze of lemon. Arrange the haloumi and zucchini in a row on the serving plates. 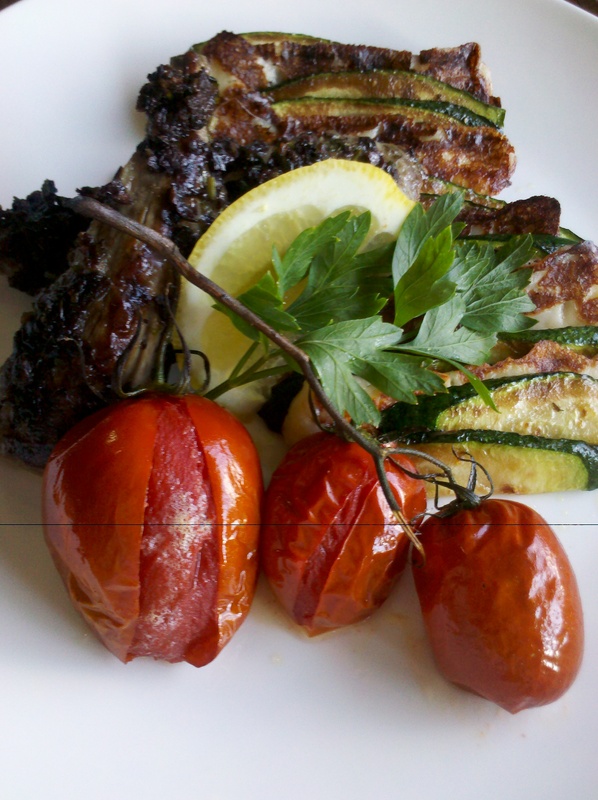 Arrange the lamb and tomatoes on the plate. Garnish with a wedge of lemon and fresh parsley. Serve immediately. This entry was posted in Dinner and tagged Greek food, lamb. Bookmark the permalink.